If you are feeling stressed or have a tight, painful neck or back this self-massage tool has a special tripod design for effective massage and acupressure that extracts back and neck stress for total body relaxation and stress relief. Sleep better tonight by releasing stress, tightness and strain in your body using this tool for a minute or more before bed - giving you deep, uninterrupted sleep all night. The easiest massage tool on the market is finally here, including Dr. Berg's step-by-step Digital Video Tutorial that shows you how simple it is for you to use on a bed, chair or couch for fast relief. 100% Guaranteed. 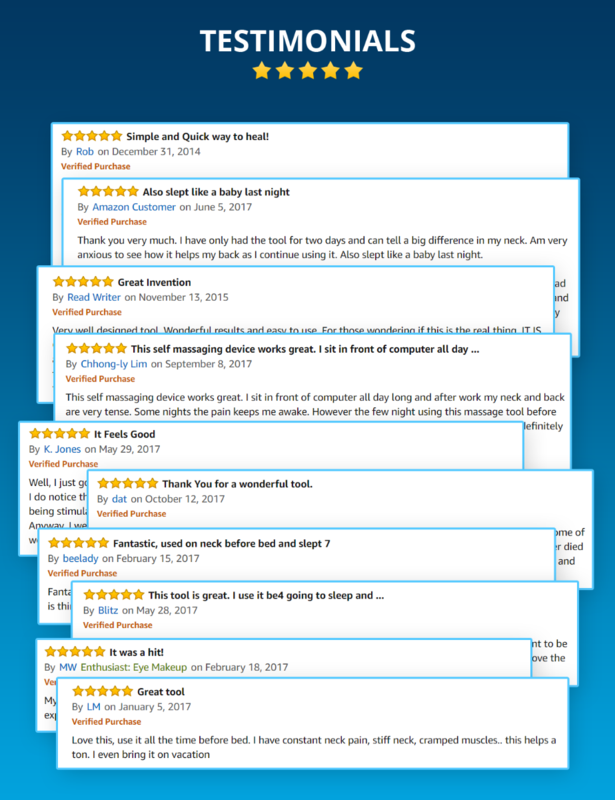 This remarkable massage tool ws developed to mimic the healing hands of Dr. Eric Berg, a chiropractor with over 25 years of experience in eliminating stress in his patients. It's 100% guaranteed that you'll enjoy the same relief as you would in a session with a leading chiropractor.... without the hassle of a trip to the office. Most people agree - stress levels today are at an all-time high. Dr. Berg has worked with patients for over 29 years. He has seen how stress gets so bad that his patients can't 'turn off' anymore. Old stress accumulates in the body, showing up in neck and back pain, tightness and strain. The pile-up of stress and tension makes it almost impossible to get enough good quality sleep at night. And lack of sleep just adds to your levels of stress, taking the situation from bad to worse. When you don't recharge with enough sleep, your energy levels are low, your fat burning hormones get shut off and your appetite skyrockets. This can lead to weight gain and the health problems that go hand in hand with excess body fat. Many people turn to chemical solution when this happens, including alcohol and sleeping pills. But none of those artificial 'Band-Aid' solutions addresses the real problem: stress. And so you continue building up stress levels in your body and maintain the vicious cycle of sleep problems and health fallout. Dr. Berg, a leading chiropractor, created this powerfull massage tool to pull out the old stress from your back, neck and feel. It was designed to mimic his hand to give you the same acupressure technique that he uses with his patients to eliminate stress and promote restful sleep. Just use it on a chair, couch or bed 2-5 minutes before going to bed for deeper, more restful sleep and improved health and vitality. Enjoy feeling more relaxed and calm all day! Stop tossing and turning and get 7-8 hours of uninterrupted sleep tonight! Feel deep relaxation and reduce discomfort caused by stress build up in your body! Stop struggling through your day feeling exhausted - instead enjoy renewed energy! One of the easiest massage tools on the market today with a simple step-by-step digital video tutorial! Enjoy the same stress and pain relief you'd get from a visit to a chiropractor's office! You'll enjoy amazing results or get a full refund, no questions asked! 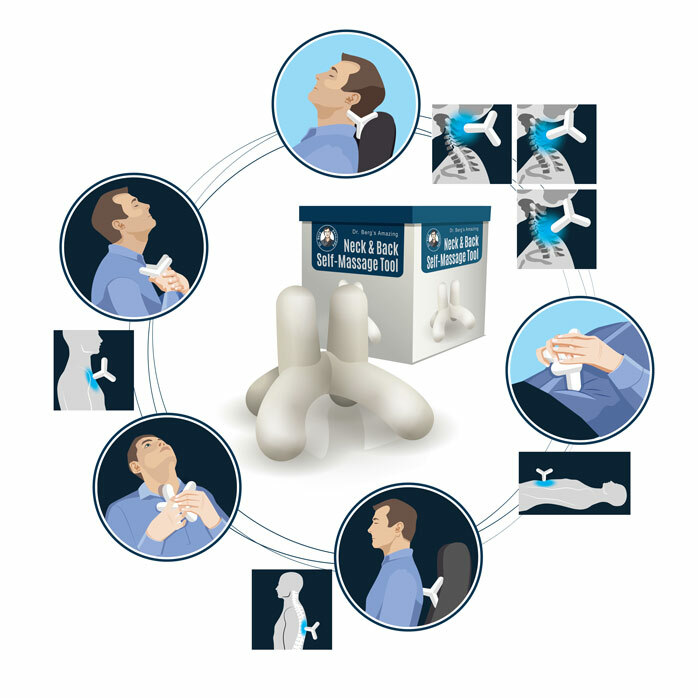 Designed by chiropractor to release neck and back stress in as little as one minute. Unique tripod design allows you to easily stabilize it on your bed, couch or chair. 3 different widths fit every body type and size. Gives you whole body stress relief - can be used anywhere you have tension, tightness or pain. Use before bed to improve your quality of sleep, so you 7-8 hours of uninterrupted, restful sleep at night. Wake up refreshed in the morning and feeling energetic for your day. Easy to use with step-by-step Digital Video Tutorial with Dr. Berg. 100% Satisfaction Guaranteed - ZERO risk for you try it and see for yourself. Learn how to do acupressure on yourself using Dr. Berg's specially designed device. This invention makes it easy to reduce stress and get great rest. Use it as a tripod to address different stress points on your body. This is the complete program which comes with an additional step-by-step video tutorial showing you how to reduce your stress, rest and feel great. The basic program comes with step-by-step instructions in a PDF document. It all started when Dr. Berg’s usual go-to person for massage in his clinic was out of the office. He had been having some challenging problems, causing tension and pain to build up in his neck and shoulders. This happened from time to time, but he always had help resolving it quickly. Not this time. She was out of the office and no one else was available. I wish I could just get another pair of my own hands, he thought. Then the light bulb went on in his head. That’s when Dr. Berg started designing his self-massage tool – designed after his own hands and his knowledge of acupressure. But in addition to being effective, it also had to be something that super-easy to use. Especially on the back and neck, which are hard to reach. So he came up with his tripod design that would stay stable on any surface. So you can lean back on it in a chair or lay down on it in bed. Now anyone could use it anywhere on their body – including their hard-to-reach areas. You can even use the tool on your feet. Then Dr. Berg made it fit 3 different sizes. Because as a chiropractor he knew it had to fit every size and shape, just like his patients.